The Taiwanese production and broadcasting company Gala TV has announced on Tuesday that it is making a live-action television adaptation of Kenjirou Hata's Hayate the Combat Butler comedy manga. 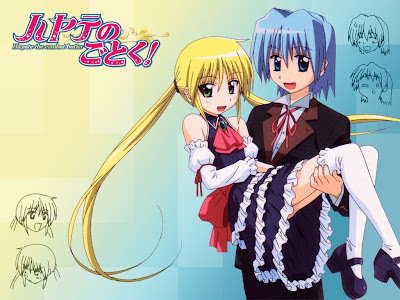 The story follows a boy named Hayate who serves as a butler, bodyguard, confidante, and more to a girl named Nagi to pay off a 156,804,000-yen (about US$1.8-million) debt. 20-year-old Korean actress Shin-Hye Park will play Nagi, while 28-year-old George Hu will play Hayate himself. Viz Media will publish the 16th manga volume in North America next month. The manga already inspired two television anime series in Japan, and Bandai Entertainment announced at Anime Expo 2008 that it licensed the first anime series for North America. Crunchyroll simulcasted the second anime series in several countries as it aired Japan in last year. Other manga that have inspired live-action television series in Taiwan include Skip Beat!, Itazura na Kiss (It Started With a Kiss), and Hana Yori Dango (Meteor GARDEN). the story line is almost similar to "Take care of this young lady" a korean drama? what do you think is the difference between this manga and this kdrama? I love to watch Animax hayate .. may have similarities with the story take care of my lady .. but I hope there will be variations in the story later .. Please be a hit !!!!!!!!! YES! PLEASE BE A HIT!! !